Childcare provided through NannyPod's app and your Local Area Manager in Miami FL (Downtown / Brickell / Key Biscayne) is the easiest hassle-free way for parents to get a break for a few hours. You can now have complete peace of mind knowing that a locally approved babysitter, nanny or infant night nurse will look after your children on date night, while you're at work, or even overnight. Looking for a Babysitter or Infant Night Nurse Care in Miami FL (Downtown / Brickell / Key Biscayne)? All of the childcare staff on the NannyPod platform are locally approved, so it really is safe, secure & reliable. Babysitters come in 5 Levels, (Copper, Bronze, Silver, Gold & Platinum). Infant Night Nurses are all fully qualified Registered Nurses (RNs). Looking for a local Family Consult in person to cover your exact infant / childcare needs or maybe find a Nanny in Miami FL (Downtown / Brickell / Key Biscayne)who is matched to your family? 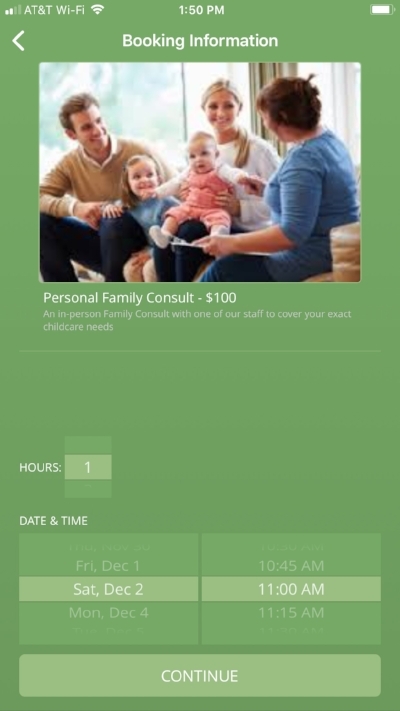 Just request a Family Consults through the App once you are registered and have paid the membership fee.